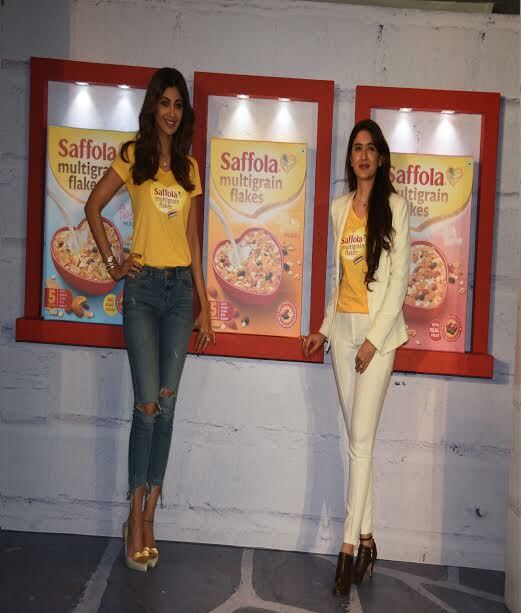 Mumbai, March 25, 2017: Fitness diva Shilpa Shetty Kundra and celebrity nutritionist Pooja Makhija came together on a breakfast date to launch Saffola Multigrain Flakes! They shared their nutrition know-how with the media on the goodness of five grains over the single grain of cornflakes, making it #TheBetterFlakes for a better breakfast. The flakes comprise of 5 grains - Oats, Barley, Rice, Wheat and Corn. The 5 multigrain flakes makes breakfast a healthy delight. 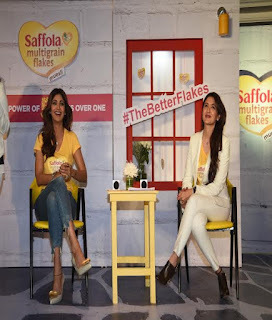 To acquaint people with the needs of these multi-nutrient flakes, Saffola on boarded people in the know like, celebrated actress and fitness diva Shilpa Shetty Kundra and renowned dietician and health expert Pooja Makhija. Saffola Multigrain flakes upholds the cause of a good and wholesome breakfast which is a powerful source of healthy living. Our body requires a combination of nutrients to function well. This requirement, very successfully, is satiated by the Saffola Multigrain Flakes. The Multi-grain flakes offer a complete nourishment as oppose to the single grained cornflakes. “With such a multi-beneficial product in the market, I believe people will choose this over anything else because precisely I would”, she said while acknowledging the wholesome blend of the product. During breakfast, people need all-rounded nutrition. Saffola Multigrain Flakes has five wholegrains, which give multiple benefits of fibre, protein, minerals, and antioxidants at one go! So it is the Better Flakes after all!” added Pooja Makhija. Healthy and delicious is now possible with Saffola Multigrain flakes where these better flakes provide you with the power of 5 grains in one. #TheBetterFlakes has 50% more whole grains than single grain corn flakes and also provides you with fibres which helps keep fuller for longer. Saffola Multigrain Flakes come in three variants – Nutty Crunch, Fruit Rush and Lite Delight are available across outlets pan-India at a special introductory price starting from Rs. 145 for 225 gms. Saffola is a health care brand. Its portfolio spans product categories-edible oils, functional foods, and salt. For the last 10 years, Saffolalife has been educating Indians on preventive heart care through the year. Saffola has over the years built an ecosystem which works actively towards adopting a healthier lifestyle.